I’m dispensing with today’s two Daily Post Prompts because the first one is similar to one I’ve already written on in this Challenge, and I’m not particularly interested in the second. So I popped into Plinky to take a look at some of their prompts, and one caught my eye: Which pop culture icon’s unexpected death affected you the most? Now, not many stars deaths have affected me badly, however, I expect to have some more affect me in the next few years. See, up until now, most star deaths have been people who I didn’t know. I hadn’t seen their movies, or haven’t listened to their music. 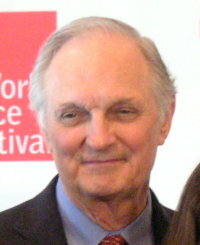 However, stars such as Alan Alda, whom I love from Hawkeye in M*A*S*H, is getting older. Now I know that I cried when I watched episodes in M*A*S*H when Radar left, or when Henry left. How will I be when they leave for good? Stars from Star Trek I’m sure will bring similar reactions. And more. So while in this past year we have lost many great actors, such as Leslie Nielsen, and pop culture icon Gary Coleman, I know that one day, we will lose the actors that mean so much to my generation, and on that day we shall remember them. Previous Previous post: What’s the most important thing I’ve been putting off?